Medina Parrilla, is a decorated scholastic player seeking new horizons as she enters high school this fall. Currently, Parrilla is competing in the World Youth Championships (Girls under-14) in Belfort, France. She is one of a contingent of 31 U.S. players making the trip. More than 20 years ago, Bernadette Reddick played in the under-14 Championships in France. Round 1: Parrilla - MAKAROVA Kermen (Estonia 1877), 1-0. Round 2: PORAT Maya (Israel 1948) - Parrilla, 0-1. Round 3: SKINKE Katrina (Latvia 2100) - Parrilla, ½-½. Round 4: Parrilla - WINKELMANN Elena (Germany 2040), 0-1. Round 5: BRUNELLO Roberta (Italy 1837) - Parrilla, 0-1. Round 6: Parrilla - AGREST Inna (Sweden 1984), ½-½. Round 7: SMITH WFM Hazel (Canada 2023) - Parrilla, 1-0. Round 8: Parrilla - MANYOKI Anna (Hungary 1850), ½-½. The Chess Drum, "New York scholastic players hot in Arizona!" 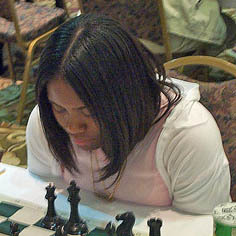 World Championships in Greece," 2004. The Chess Drum, "Parrilla wins 7th Grade National Title!" The Chess Drum, "Girl Power: Ballom and Parrilla on the rise!" The Chess Drum, "Medina Parrilla, 12, definitely got game!!"